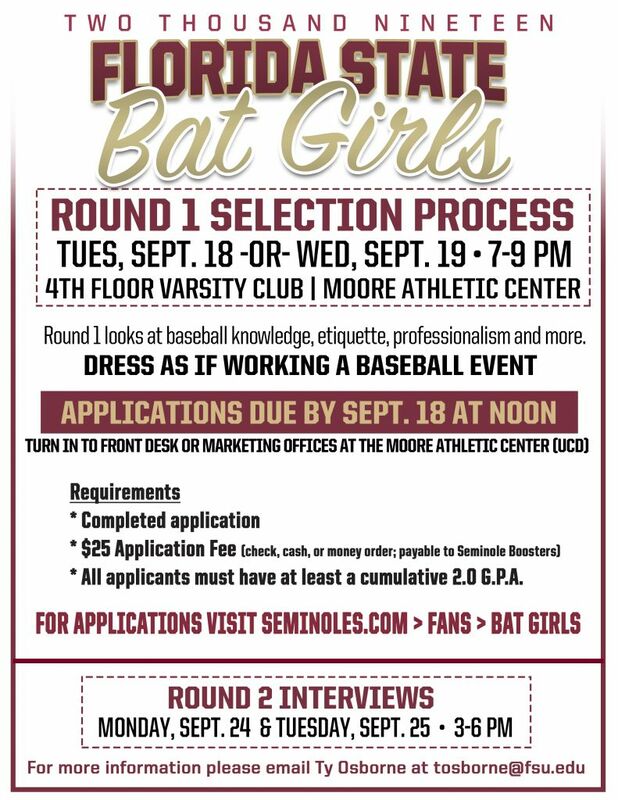 The Florida State Bat Girls is a spirit organization that contributes to the nationally ranked baseball program. The squad consists of approximately 24 members of various classes, backgrounds, and academic areas from Florida State. These members have a general knowledge of the game of baseball, as well as outgoing charismatic personalities. The Bat Girls’ main purpose is to assist in game day operations. This includes on-field operations such as the retrieval of bats and foul balls, as well as off-field activities including program sales, fan interaction, and the implementation of marketing promotions throughout each game. The squad also assists in the Baseball and Athletics Department offices throughout the year. Additionally, the Bat Girls are involved in multiple community service outreach events and fundraisers each semester.